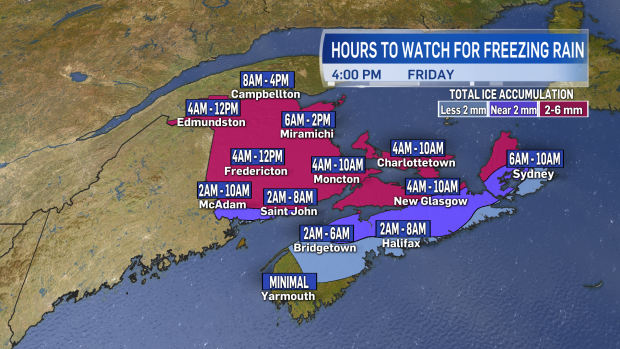 This maps shows the expected start times for freezing rain across the Maritimes early Friday morning. There is a freezing rain warning in effect for most parts of the Maritimes and that will lead to icy conditions in the Maritimes on Friday. A developing warm front moving up through the northeastern United States will force mild, most air over cold surface temperatures for the region beginning early Friday morning. Like all freezing rain events, impacts to the region will be varied. Parts of the South Shore of Nova Scotia will see virtually no freezing rain before a turn to rain, drizzle, and fog. Conversely, parts of New Brunswick and even western Prince Edward Island will see the freezing rain extended for several hours. It is very unlikely that any area in the Maritimes will see more than 12 hours of freezing rain and that should keep it shy of ice storm category for us. The weather system will create patchy glazing to an icy coating for a period of time for many before temperatures come up above freezing and the switch to rain takes place. Caution should be taken when travelling on roads, sidewalks, and walking paths, especially if they have not been treated. Temperatures across the Maritimes will fall quickly Friday evening into Saturday morning as Arctic-sourced air returns for the weekend. Any wet surfaces may become icy during this time. 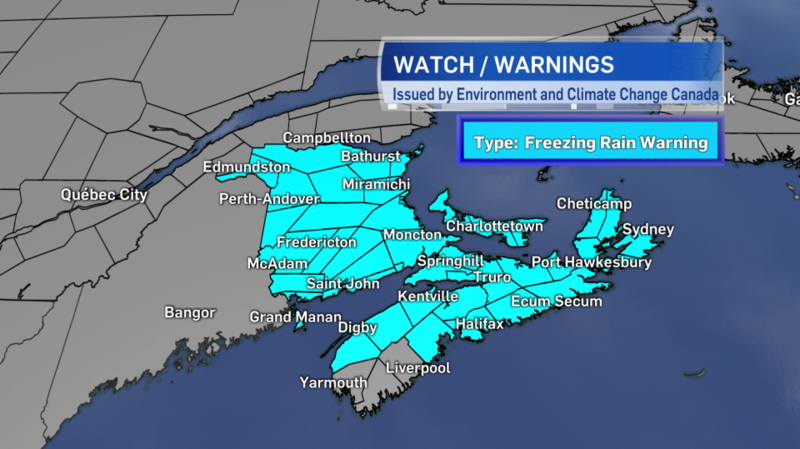 A freezing rain warning is in effect for most of the Maritimes tonight and into Friday morning, when it is expected to being.